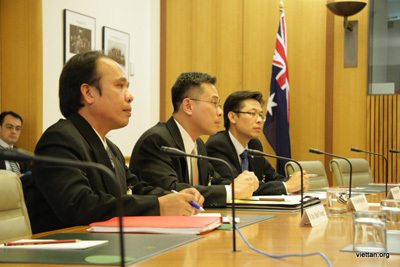 Thank you for inviting Viet Tan (Vietnam Reform Party) to appear at today’s public hearing as part of the inquiry into human rights mechanisms and the Asia-Pacific. Viet Tan is an unsanctioned pro-democracy party active in Vietnam. Our goal is to improve the current human rights situation and to bring about peaceful political change through the power of the Vietnamese people. We believe that a free society is not only the best means to harness the vast potential of the country and its people, but also the foundation for human rights mechanisms. 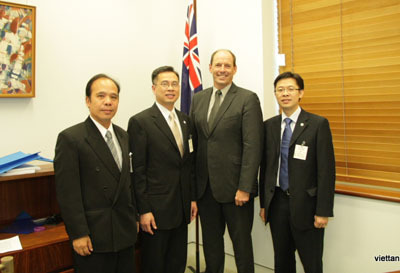 In addition, a democratic Vietnam can be an anchor for prosperity and stability within the Asia-Pacific region. Vietnam is governed by a corrupt dictatorship with one of the worst human rights records in the world. The country has a vibrant, youthful population whose lives and aspirations are repressed by a security apparatus and arbitrary “laws” designed to protect the Communist Party from dissenting views and organized opposition. The government uses ambiguous decrees and legal provisions to criminalize political speech and to regard legitimate peaceful opposition as crimes of national security. 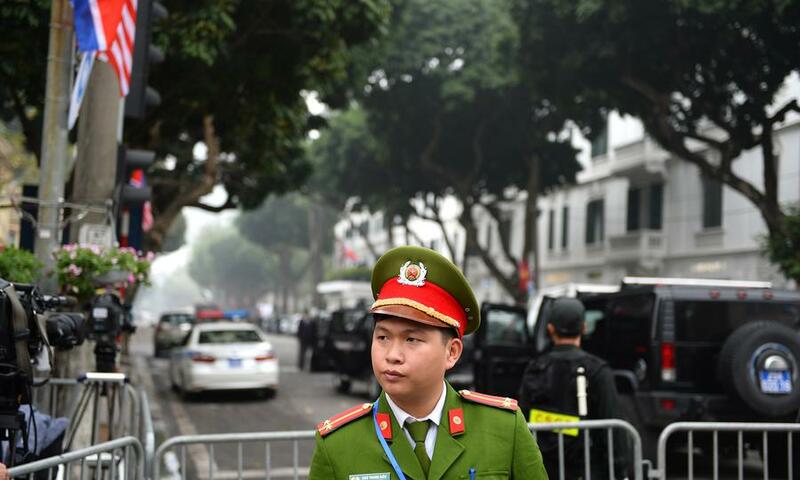 Employing such wide-sweeping laws, the Vietnamese government has unleashed a series of crackdowns, which Human Rights Watch labeled the worst in 20 years. Most recently, in September 2008, numerous democracy activists (including Nguyen Xuan Nghia, Pham Thanh Nghien, Ngo Quynh, Vu Hung, Tran Duc Thach, Nguyen Van Tuc and Pham Van Troi) were arrested for distributing pro-democracy leaflets and posting banners critical of the government. They are still being detained without any formal charges. In the case of Pham Thanh Nghien, despite being already detained for six months, her family has yet been allowed to visit her. It is reported that her health is deteriorating in detention. 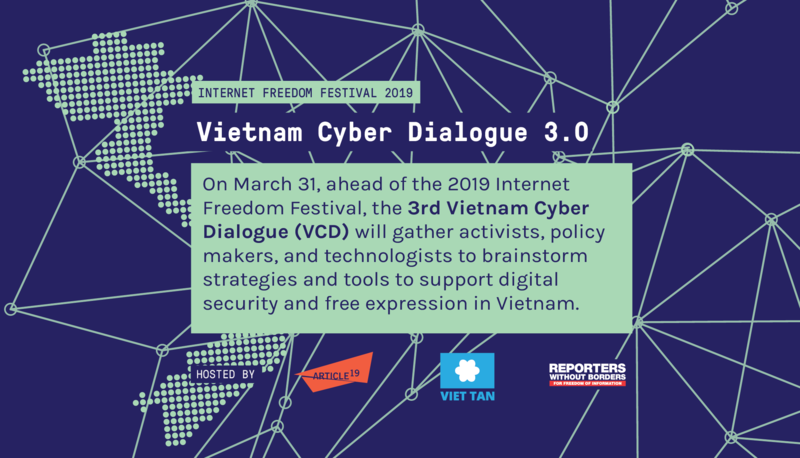 Vietnam’s constitution guarantees freedom of speech and press; however the government continues to suppress independent-minded journalists and the internet. 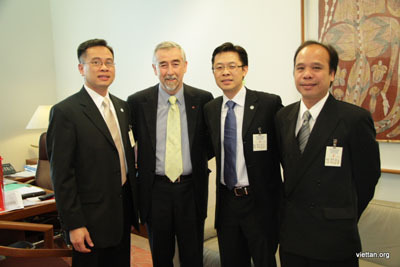 Authorities persecute especially those who discuss political pluralism or question policies on sensitive issues such as corruption involving government officials or border disputes with China. A case in point was when two reporters, Nguyen Viet Chien and Nguyen Van Hai of the daily newspapers Thanh Nien and Tuoi Tre respectively, were arrested for exposing the multi-million dollar political corruption scandal that involved embezzlement, gambling and prostitution at the Ministry of Transport (PMU-18)¹. The men were later tried, convicted and charged with “abusing democratic freedoms”. Similarly, in recent months authorities instigated a campaign to silence internet activists. 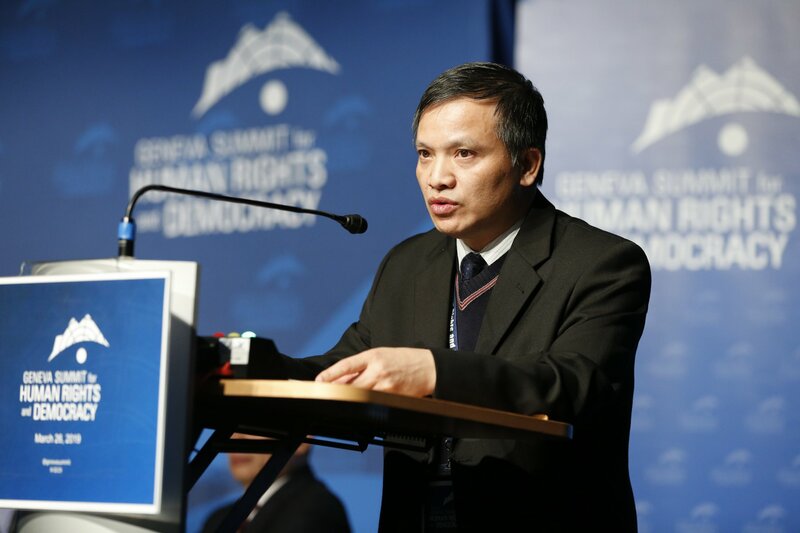 A well known blogger, Dieu Cay was arrested after criticizing the government’s policies on territorial disputes with China. He was sentenced to 30 months in prison on “tax evasion” charges in a trial that was condemned by the international community. His family and fellow bloggers have been constantly harassed and threatened. The government even went to the extent of issuing a new decree in December 2008, prohibiting bloggers from posting articles that may be viewed as “undermining national security”. This new decree also required international internet service providers to report private user information to the Authorities. All religious organizations or practices in Vietnam must be officially registered and recognized by the government. The Unified Buddhist Church of Vietnam (UBCV) is still outlawed and its highest leader, The Venerable Thich Quang Do, has been subjected to arbitrary house arrest and harassment for more than 30 years. The Catholic Church is still under great restriction. Any appointment or assignment of its clergy requires government approval. In September 2008, multiple large-scale vigil masses were conducted by the Archbishop of Hanoi and Thai Ha parish with sometimes more than 15,000 parishioners attending, and calling for return of confiscated Church properties. Eight participated parishioners were arrested and later convicted. But most notably is the severely oppressed Mennonite Church where its followers comprised mostly of ethnic minorities living in the Central Highland of Vietnam. One of the Church leaders, Pastor Nguyen Hong Quang has repeatedly been arrested and imprisoned for worshiping without official sanction. He and his colleagues are currently subject to police surveillance and harassment. There is no recognised independent worker union in Vietnam. Workers are forbidden to form or join any independent union. There is only one state-owned trade union called the Vietnam General Confederation of Labor, which answers directly to the Vietnamese Communist Party. Because of this contradictory role, workers rights are often abused and neglected. In recent years, widespread labor strikes have occurred throughout the country due to poor working conditions, low wages and degrading treatment. Thousands of workers attended these strikes and numerous strike leaders were arrested and imprisoned. Under Vietnam law, strikes without government permission are considered illegal, therefore workers often put themselves at significant risk of being persecuted by authorities and sacked by their employer. The labor unrest reflects the underlying economic hardship and social discontent. Tight government control over workers and restrictions on the right to strike severely undermines the International Labor Code. The Australia-Vietnam Human Rights Dialogue can be an effective mechanism to encourage greater political freedom in Vietnam. To increase its efficacy, we suggest an emphasis on concrete programs. Programs should specifically focus on promoting freedom of media, unrestricted use of the internet, and freedom of association. Any financial assistance for these projects needs to have clear benchmarks; detailed goals and progress must be clearly documented. Outcomes need to be reported back to the Joint Standing Committee and be transparent to the public for review. While instituting mechanisms to prevent and redress human rights violations are necessary; promoting democracy is as important in helping to guarantee these mechanisms in the long term. One-party authoritarian system is a breeding ground for human rights abuses. We believe that the solution to human rights is a democratic society where citizens have the right to make political choices and hold government accountable to its actions. 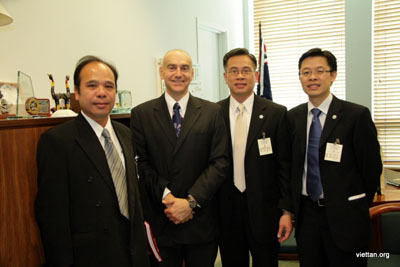 The Australian parliament can support the people of Vietnam and other repressed country by speaking out against human rights persecutions, engaging with civil society and democratic groups, and continuing to press the current regime for change. We strongly support the initiative of the Working Group for an ASEAN Human Rights Mechanism to form an intergovernmental human rights commission. We recommend that all ASEAN member states are automatic members of this Commission and therefore must abide by international human rights standards. The Commission will act as a monitoring body to ensure that complaints can be heard and recommendations are to be implemented. We also advocate that the ASEAN Human Rights Commission can recommend a Court, where in selected circumstances can deliver a unified obligatory decision. Although Australia is not an ASEAN member, but with its long history of a close-working relationship and commitment in the region, we believe that Australia can engage with ASEAN and the Asia Pacific Forum to further advance human rights protection in the region. 1. PMU-18 (Project Management Unit 18) is a bureau within the transportation ministry for road construction projects. It receives funding from overseas donors, including Japan, Australia, European Union and the World Bank.